'First diesel outright winner' is the goal set by the ISUZU rally team as they prepare to do battle later this month in an event previously dominated by petrol-powered vehicles. 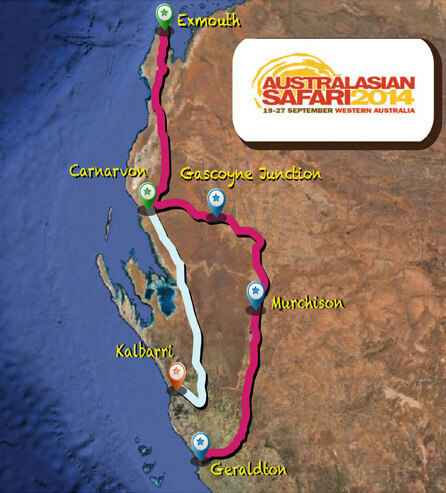 Cross-country racing star Bruce Garland will spearhead a three-car team tackling the Australasian Safari, which starts with a 'Safari Show' at Perth's Wanneroo Showgrounds on Friday, September 19 and finishes in Kalbarri (592km north of Perth) on Saturday, September 27. The Sydney-based duo will contest the Extreme 4WD (T1) class in the high-powered ISUZU D-MAX they took to last year's Dakar Rally. Western Australia's Adrian Di Lallo will drive an ISUZU mu-X in the production car (T2) class while the team will also run Thai driver Olan Sornsirirat in a production class D-MAX. "I still reckon a diesel can win the Safari even though history has so far proved otherwise," five-time winner Garland says. "You need the right car, the right crew and the right tyres and a bit of luck, so if we have all that lined up – and we believe we do – then we shall see what happens. It's certainly a trophy I would love to add to my collection." Garland and Di Lallo recently spent several days testing the cars with ISUZU engineers, tuning the vehicles to the best possible capacity. Garland's D-MAX is now putting out around 200kW of power and 700Nm of torque compared to figures of around 190/600 last year, while the mu-X Di Lallo will drive is putting out around 180kW and 600Nm. Standard figures for either car straight off the showroom floor are 130/380. Class wins are well within the grasp of both crews and Garland, who turned 56 this year, still believes he has the knowledge and the skill to win outright again. He's fit – having recently done much of the building of the new family home – and fully recovered after several years of medical problems including a fractured vertebra, heart attack and five bypasses, and surgery for prostate cancer, none of which stopped him racing. "I think it was race ace 'Gentleman' Jim Richards who said old age and treachery will always beat youth and exuberance and I wanna be just like him! Jim's still racing and still getting great results. "The Safari is as much about driving smart as driving hard and that something you only learn from experience. Harry and I have the experience, the car is great and a proven performer, and we certainly believe we can do it, if a little luck comes our way. "You could say we are cautiously optimistic – but you can also be sure we will party hard if we do win!" Garland and Suzuki are contesting the event for the 18th time, and have won it five times. Di Lallo has contested the event three times in the past, finishing each time and earning a class podium position in 2011 on his second attempt. The team will also provide some back-up to two other ISUZU mu-X crews, one a Thai entry and the other to be campaigned by Garland's long-time mate and another Safari stalwart, Reg Owen. The Thai connection comes from Garland and Suzuki's experiences racing in cross-country rallies in Asia and Garland describes the two crews as 'good young guys who know what they are doing'. 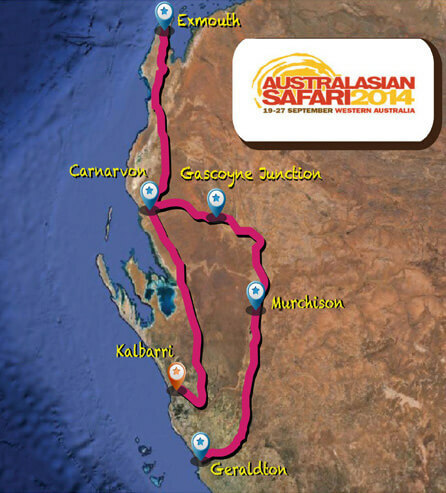 The 2014 Australasian Safari will kick off with the ceremonial start in Perth before competitors head 424km north to Geraldton for the short Prologue to determine starting order. Between start and finish are seven days of endurance racing throughout the Western Australia outback with overnight stops in Geraldton, Murchison, Gascoyne (two nights), Exmouth (two nights) and Carnarvon. The event covers more than 2500km of sand, salt plains, rough desert tracks and dry riverbeds. ISUZU rally team is ready to roll in West Australia, after the 2014 Australasian Safari cross-country rally kicked off at Perth's Wanneroo Showgrounds tonight [Friday, Sept 19] with a 'Safari Show' and ceremonial start. Cross-country racing star Bruce Garland and co-driver Harry Suzuki head up a three-car team for the Safari which finishes in Kalbarri (592km north of Perth) on Saturday, September 27. The Sydney-based duo will contest the Extreme 4WD (T1 – car 102) class in the high-powered ISUZU D-MAX they took to last year's Dakar Rally. Western Australia's Adrian Di Lallo and Roger Pedersen will drive an ISUZU mu-X in the production car (T2 – car 118) class . The team will also run the ISUZU Thailand team of driver Olan Sornsirirat and co-driver Veerachai Thorangkoon in a production class D-MAX (T2.2 – car 127). The international T2 class covers 4WD vehicles with minor modifications, basically limited to some shock absorber changes and the fitting of required safety equipment. "We're as ready as we can be," Garland said, as the three crews and their colleagues – around 17 personnel in total – enjoyed the official farewell celebrations. "We have three trucks packed with spares and tyres and everyone's swags and bags for the week so we can camp out every night. That's all part of the fun of the Safari. The tricky part was getting it all in some sort of order so we can find things when we need them!" The team is aiming for class wins as a minimum, and 'first diesel outright winner' in an event previously dominated by petrol-powered vehicles. Garland and Di Lallo spent several days last month testing the cars with ISUZU engineer, tuning the vehicles to the best possible capacity. Garland's D-MAX is now putting out around 200kW of power and 700Nm of torque compared to figures of around 190/600 last year, while the MU-X Di Lallo will drive is putting out around 180kW and 600Nm. Sornsirirat's D-MAX is the one Garland campaigned in last year's Safari, putting out around 156kW and 456Nm. The team will also provide some technical advice and back-up support to two other ISUZU crews, one a Thai entry (car 114, D-MAX, crewed by Vorapot Bunchuaylua and Chupong Chaiwan) and the other (car 115, mu-X) to be campaigned by Garland's long-time mate and another Safari stalwart, Reg Owen, co-driven by Russell Cairns. 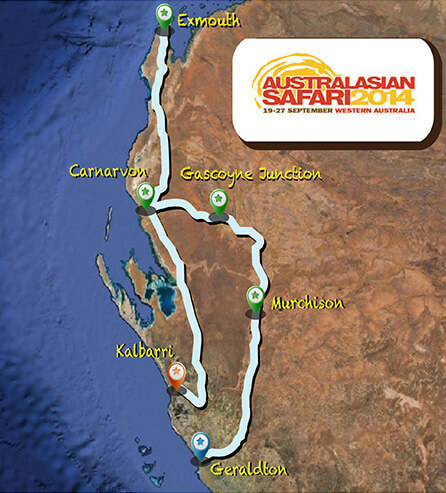 The 2014 Australasian Safari kicks off with the ceremonial start in Perth before competitors head 424km north to Geraldton (Saturday, September 20) for the short Prologue to determine starting order. Between start and finish are seven days of endurance racing throughout the Western Australia outback with overnight stops in Geraldton, Murchison, Gascoyne (two nights), Exmouth (two nights) and Carnarvon. The event covers more than 3000km of sand, salt plains, rough desert tracks and dry riverbeds. ISUZU rally team has taken a 'steady as it goes' approach to Day One of the 2014 Australasian Safari, with the starting order for competition sorted over a short sprint stage. Competitors drove 424km north from the ceremonial start in the West Australian capital of Perth, to Geraldton, on the mid-west coast, for the cross-country rally's 10km Glengarry Prologue which determined who will start where when full competition gets underway tomorrow (Sunday, September 21). Sydney's Bruce Garland and Harry Suzuki will start seventh in their high-performance Dakar-spec ISUZU D-MAX, while Western Australia's Adrian Di Lallo and Roger Pedersen posted 12th in their production-class ISUZU mu-X. Thai teammates Olan Sornsirirat and Veerachai Thorangkoon will be 18th car out, in their production class D-MAX. "You don't win an event on the Prologue so there is no point in trying to be a hero on Day One," said team leader Bruce Garland at the Saturday night bivouac in Geraldton. "We all took it pretty easy out there and we're all pretty happy with our pace. There's a long way to go before the finish next weekend and if you push too hard too soon, it's very easy to come unstuck." Di Lallo took the same laidback approach to the sprint, in line with his aim of taking victory in the production class and getting the highest possible result outright. He's champing at the bit to get started. The car is going really well and feels strong and quick. I'm happy with it and think we'll do well in the production class. "I'm looking forward to the event because the Safari stages are great – it's always a good course. I also like it because it's in my home state, it's well run and it's a really friendly environment. There's a great feeling of mateship with the competitors, crew and officials. We also get to see some spectacular places in Western Australia." 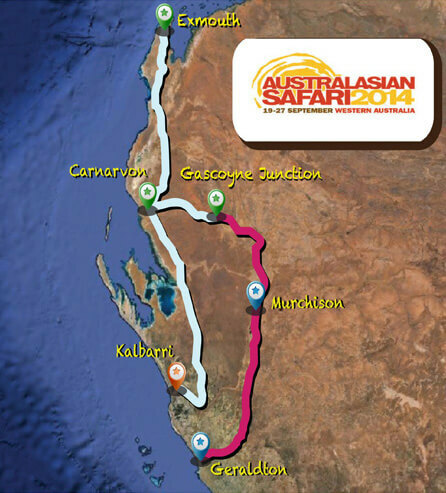 The 2014 Australasian Safari kicked off with a ceremonial start in Perth's Wanneroo Showground last night (Friday, September 19) and finishes in Kalbarri (592km north of Perth) on Saturday, September 27. Between start and finish are seven days of endurance racing throughout the Western Australia outback with overnight stops in Geraldton, Murchison, Gascoyne (two nights), Exmouth (two nights) and Carnarvon. The event covers more than 3000km of sand, salt plains, rough desert tracks and dry riverbeds. Tomorrow (Sunday, September 21) on the Utakarra to Murchison leg, crews will tackle three stages: the 88.48km Greenough River, 167.14km Murchison River, and 26.22km Murchison Oasis, before overnighting at Murchison which is a large agricultural region in central WA, 50,000 square kilometres in size. It's the only shire in Australia without a town and, according to the 2006 Census, the least populous local government area in the state – current figures suggest fewer than 120 people! The region is home to extensive mining areas – some active and many abandoned – as well as around 29 large sheep and goat stations, mainly family operated. The three cars are competing under the banner of ISUZU Rally team, a performance parts company owned by Garland and his long-time co-driver, Harry Suzuki. They also have support from ISUZU in Japan, Thailand and Australia. 'Driving smarter not harder' is the approach being taken by the trio of ISUZU vehicles, after a second day of rough and tumble on the 2014 Australasian Safari. The Safari is a seven-day cross-country rally across the West Australian outback, open to cars, buggies, bikes and quad bikes. Day Two was made up of two long stages (171.47km, 255.94km) which took competitors from the remote mid-western agricultural region of Murchison to Gascoyne Junction, around 170km from the coast and nearly 1000km north of the West Australian capital, Perth, where the event started last Saturday. At the end of Day Two, ISUZU rally team’s Bruce Garland and Harry Suzuki were fourth outright in their high-performance Dakar-spec ISUZU D-MAX while teammates Adrian Di Lallo and Roger Pedersen and their production-class ISUZU mu-X were in seventh. Thailand's Olan Sornsirirat and Veerachai Thorangkoon, the third team in the official 'ISUZU trio', had brought their production class D-MAX into 21st place. "We're just taking it steady at this point, because you don't win events in the first few days, but you can lose them," Garland says. "It was a fairly tough day today and we have two more hard days to come, but we are making good progress and I am really happy with the D-MAX. It's perfect. We're not at full pace but doing a good clip and I'm happy with that." Di Lallo is also happy with his progress, aside from losing some time on Day One with a navigation issue. "The mu-X is running really well. For a production car, it's outstanding. We had a super day. This morning's stage was great but the marathon stage this afternoon was difficult, technical and rough," Di Lallo says. "Being a production car, we have to go over the rough area a lot slower than others. The good thing is that we are collecting very important data on the car, which is brand new. We're learning the life of all the parts and that will help us in future events." This morning after overnight rain soaked the bivouac and threatened the possibility of a stage cancellation. As it turned out, while there were some muddy patches on the route, the wet weather simply helped to dampen down the dust and didn't slow the field too much at all. Thirty-seven cars entered in the 'auto' division of the Safari, of which two have already registered as retirements. However, two other ISUZU crews who are receiving technical advice and back-up support from ISUZU are doing well. The mu-X being campaigned by Garland's long-time mate and another Safari stalwart, Reg Owen with co-driver Russell Cairns is now in ninth. The Thai-entered D-MAX crewed by Vorapot Bunchuaylua and Chupong Chaiwan is in 13th. The crews now have two nights at Gascoyne Junction, a small town 174km east (inland) from Carnarvon and about 965km north of the West Australian capital, Perth. It's a centre for mining, pastoral and merino fine wool industries and also serves as a gateway to Mount Augustus National Park. Four years ago, the town and its surrounds were devastated by floods but the town has been reborn, courtesy of an $8 million rebuilding program. Opened within the last few months are a new 24-hour fuel station, general store, tavern and restaurant, caravan park with pool and playground and a new main street. After two stages tomorrow (Tuesday: 147.15km; 288.64km) and another night in Gascoyne, the crews will head for Exmouth (two nights) and Carnarvon. The event covers more than 3000km of sand, salt plains, rough desert tracks and dry riverbeds. ISUZU rally team’s Bruce Garland is facing a late night in the service park after an electrical gremlin halted his charge towards third place in the 2014 Australasian Safari. Garland and long-time co-driver Harry Suzuki were happy with their pace on the first stage of Day Three of the seven-day cross-country rally across the West Australian outback when their high-performance Dakar-spec ISUZU D-MAX simply stopped. "The plan is to start tomorrow, but obviously we are bitterly disappointed because we were really in with a podium chance, and hoping for the top step," said Garland, who was less than 20 seconds from third outright and first diesel when racing began this morning (Tuesday). "We were going gangbusters, but not driving overly hard, when the D-MAX just came to a halt. It was like someone had turned off the ignition. Harry and I crawled all over it, but despite the fact we are pretty good bush mechanics there was nothing we could do. We had to get towed in." The crew is doing a full diagnostic check on the D-MAX tonight, with Garland and Suzuki planning to start again tomorrow. "No matter what happens, we will finish this fantastic event, and we'll also be giving as much support as we can to the rest of our guys, who are doing a great job," Garland said. 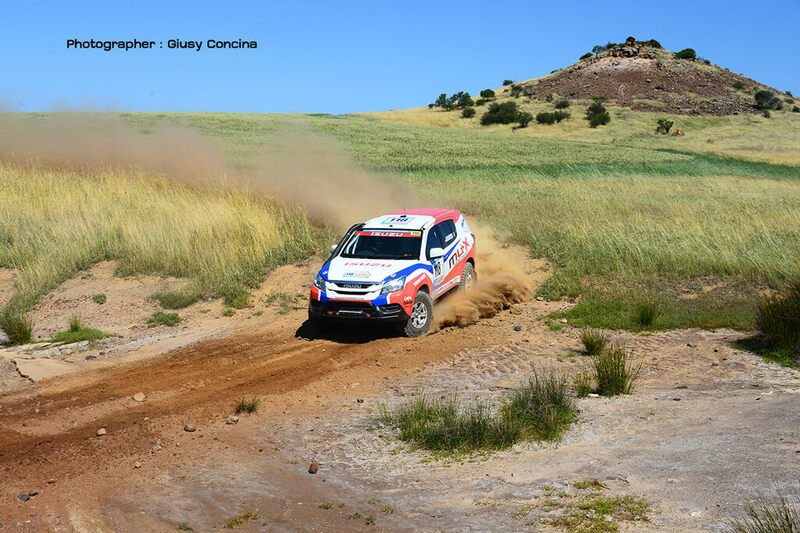 The remaining two crews of the official ISUZU rally team – and two other crews the team is supporting – have had a rough day, but all have finished strongly. The West Australian duo of Adrian Di Lallo and Roger Pedersen and their production-class ISUZU MU-X are in sixth outright while Thailand's Olan Sornsirirat and Veerachai Thorangkoon – the third team in the official 'ISUZU trio' – have brought their production class D-MAX ute into 11th place. "A tough and challenging day – very similar to a day at Dakar in that it knocked the bejesus out of you," Di Lallo said. "Navigation was rough and challenging. A creek came up faster than anticipated and I didn't have time to back off the speed. We landed on one wheel vertical, did a pirouette and ended up on the other side of the fence without any of our aerials! "So we had no radios, no navigation, nothing to tell distance besides the odometer – which isn't accurate enough for racing – for 200km, and no communication. Aside from that, the car is performing really well and the tyres are good." Di Lallo's co-driver, Roger 'Roj' Pedersen described the day as a car breaker. "It was like a rock field, very hard going and there's lot of broken vehicles. We were flying down a fence line – Adrian reckons I called '700 caution creek', but the creek came up early and caught us out. It was a moment, that's for sure. "We had no GPS, no rally safe, but it could've been a lot worse – we had the racing gods on our side. In hindsight, it was probably to our advantage that we lost the terratrip and communications because it made us back off a bit. The car is going great, considering what we put her through. There's really not much work to do on it tonight." The other ISUZU mu-X which is being campaigned by Garland's long-time mate, Reg Owen and co-driver Russell Cairns, is now in seventh while the Thai-entered D-MAX crewed by Vorapot Bunchuaylua and Chupong Chaiwan is in 10th (* all results provisional at time of writing). Day Three was made up of two long stages (147.15km, 288.64km) which took competitors in a loop around Gascoyne Junction, which is 174km from the coast and around 965km north of the West Australian capital, Perth, where the event kicked off with a ceremonial start last Friday night. Full competition began in Geraldton, 424km north of Perth on Sunday (September 21) and finishes in Kalbarri (592km north of Perth) on Saturday, September 27 after seven days and more than 3000km of endurance racing. Tonight (Tuesday) is the second night in Gascoyne for the crews. Tomorrow, Day Four, consists of two stages (211.79km; 107.98km) to take competitors through to Exmouth where they will spend two nights. The town, which is 1270km north of Perth, is perched on the tip of WA's North West Cape and is the gateway to the Ningaloo Coast World Heritage Area. 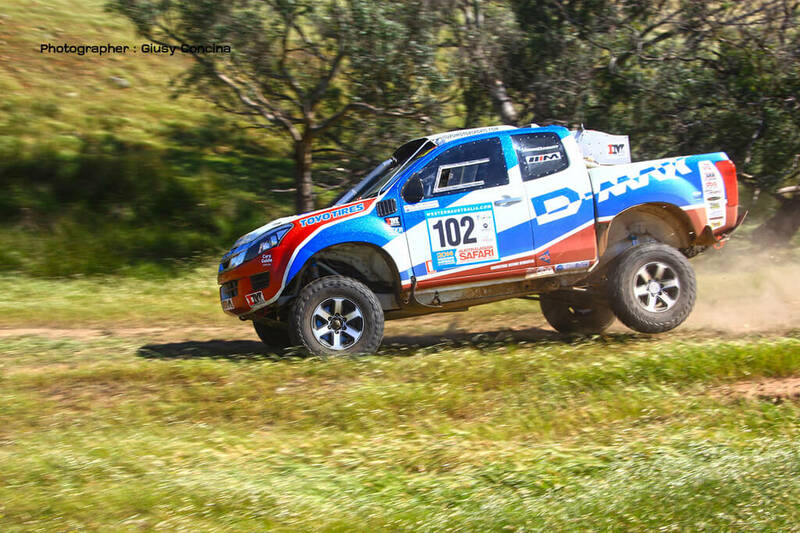 Western Australia's Adrian Di Lallo is flying the flag for ISUZU team, in fifth outright after Day Four* of the 2014 Australasian Safari, being run in his home state. Di Lallo and co-driver Roger 'Roj' Pedersen and their production-class ISUZU mu-X are also first in class, while Thailand's Olan Sornsirirat and Veerachai Thorangkoon – the third team in the official 'ISUZU trio' – have brought their production class D-MAX into 10th place and second in class. Team leaders Bruce Garland and Harry Suzuki had hoped to start Day Four despite missing most of Day Three when their high-performance Dakar-spec ISUZU D-MAX stopped 37km into the first stage, but the problem took longer to fix than expected. "We had planned to start today but we just didn't get it fixed in time. However it is now definitely up and running and we're planning on a start tomorrow and – all going well – crossing the finish line of this great event on Saturday. "Obviously we're disappointed that we won't be out there chasing a win, but we're really impressed with what the rest of the guys are doing and we'll do everything we can to help them all move further up the order." Aside from the strong results posted today by the official ISUZU rally team entrants, the two other ISUZU crews being helped by the Garland/Suzuki team have also come home well. The ISUZU mu-X which is being campaigned by Garland's long-time mate, Reg Owen and co-driver Russell Cairns, is now in sixth outright while the Thai-entered D-MAX crewed by Vorapot Bunchuaylua and Chupong Chaiwan is in ninth (* all results based on stage one of the day, and provisional at time of writing). Day Four of the seven-day cross-country rally across the West Australian outback was made up of two stages: the 211.79km Williambury and the 170.72km Emu Creek Winning (Short). The route took competitors from Gascoyne Junction to Exmouth where they will spend two nights. The town, which is 1270km north of Perth, is perched on the tip of WA's North West Cape and is the gateway to the Ningaloo Coast World Heritage Area. Day Five (Thursday) will see competitors tackle two stages in the Exmouth area before a second overnight bivouac in the town. They are the Yanrey stage, which is 160.62km, and the Emu Creek/Winning stage, which is 208.77km. ISUZU rally teams’ Adrian Di Lallo continues to nip at the heels of the frontrunners in the 2014 Australasian Safari, holding down fifth in the event being run in his home state of Western Australia. Di Lallo and co-driver Roger 'Roj' Pedersen and their production-class ISUZU mu-X are also first in their class, while Thailand's Olan Sornsirirat and Veerachai Thorangkoon – the third team in the official 'ISUZU trio' – are second in the same class, and seventh outright in their D-MAX. Competitors tackled two stages today after a 200km transport from their overnight bivouac in the north-west coastal town of Exmouth to the start of the first competition stage. That stage, Yanrey, was nearly 161km, while the afternoon stage was the 208.77km Emu Creek/Winning. "It was an early start this morning and a long drive to the start, so all in all, it was a very challenging and long day," Di Lallo says. "The last two days have been like Dakar days – rough and tough. We damaged a drive component on the rough terrain and I had to complete the second stage today in two-wheel drive. I'm surprised with the times and happy we did so well, considering what we went through." Co-driver Roger 'Roj' Pedersen had an even better reason to celebrate the result after what he described as a long, long day! "We're plugging along and having a go but not pushing the car beyond its limit. I've sat in a lot of race cars and I have to say the mu-X is a great car. For the second day in a row I didn't get us lost, so the big fella bought me an ice cream!" Team leaders Bruce Garland and Harry Suzuki were back in action today, after enforced time off (yesterday, Day Four) fixing their Dakar-spec ISUZU D-MAX. "I'm really proud of Adrian and Roj, and the other guys. They are doing a fantastic job. Four of our five ISUZUs still running and in contention for a strong finish. Just wish it was five out of five. We'll be doing our best to support them through to the end." The Thai-entered D-MAX crewed by Vorapot Bunchuaylua and Chupong Chaiwan is in sixth while the ISUZU mu-X being campaigned by Reg Owen and co-driver Russell Cairns, is now in 13th outright (* there is a query over his position, and all results are provisional at time of writing). Tomorrow, competitors will leave Exmouth, which is the gateway to the Ningaloo Coast World Heritage Area, and head south to Carnarvon, where the Gascoyne River meets the Indian Ocean, around 900km north of the West Australian capital of Perth. They will tackle three stages: Cardabia 102.22km, Gnaraloo 141.96km and Quobba, 72.05km. The 2014 Australasian Safari kicked off in Perth, with a ceremonial start last Friday night. Full competition began in Geraldton, 424km north of Perth on Sunday (September 21) and finishes in Kalbarri (592km north of Perth) on Saturday, September 27 after seven days and more than 3000km of endurance racing. Indian Ocean prawns cooked Thai-style are the reward for the ISUZU crews at the end of the second last day of the 2014 Australasian Safari, being run in Western Australia. ISUZU rally Bruce Garland leader Bruce Garland describes one of their Thai mechanics as a 'gun chef' who has whipped up something special for dinner for the crews, who have survived Day Six unscathed. Western Australia's Adrian Di Lallo and co-driver Roger 'Roj' Pedersen are the best placed of the three ISUZU rally team entries, their production-class ISUZU mu-X in fifth outright and first in class. Thailand's Olan Sornsirirat and Veerachai Thorangkoon – the third team in the official 'ISUZU trio' – are second in the same class, and eighth outright in their D-MAX. Di Lallo's co-driver 'Roj' Pedersen, making his racing comeback after a serious accident last year, has been on an unusual incentive scheme during the Safari – an ice-cream each time he got the navigation correct. Today, however, he returned the favour. "It was another great day but Adrian earned the ice-cream today – a chocolate coated banana!" Pedersen says. "It was a real drivers' day. We lost time on the third stage with a puncture over some very sharp rocky areas but we're still pushing. Only 150km of competitive to go tomorrow till the finish line!" Garland and co-driver Harry Suzuki returned to competition yesterday (Thursday) after an enforced lay-off, repairing their Dakar-spec D-MAX which had been brought to a standstill early on Day Three. While Garland describes their progress as 'cruising', now they are no longer in outright podium contention, he and Suzuki have easily posted some top 10 stage times. After the rough and tumble of the week, there are just 20 of the original 26 starters in the 'car' category still running, and despite the time lost – and extra time courtesy of penalties – Garland and Suzuki are in 17th place outright. "The conditions were quite rough out there today, but we're not pushing it. We're just following the two mu-Xs through, and making sure everyone gets to cross the finish line tomorrow," Garland says. "We did have a bit of a moment today. There was a section where Harry called a triple caution with a turn, and I thought he meant we turned after the caution, but just as well I pulled up, because the caution referred to a 100m cliff that would have dropped us straight into the Indian Ocean if we had gone over! "We stopped about a car's width from the cliff edge and turned in time! It was actually very beautiful, running along parallel to the sea, but it could have been a bit nasty! Everything is going well with the cars, and it is really just a spanner check tonight – and time to enjoy our dinner and a good night's sleep!" Aside from the strong results posted by the official ISUZU rally team, the two other ISUZU crews being helped by the Garland/Suzuki team have also come home well. The Thai-entered D-MAX crewed by Vorapot Bunchuaylua and Chupong Chaiwan remains in sixth while the ISUZU mu-X being campaigned by Safari stalwart Reg Owen and co-driver Russell Cairns, is 13th outright. Competitors tackled three stages today, taking them from Exmouth – the gateway to the Ningaloo Coast World Heritage Area – to Carnarvon, where the Gascoyne River meets the Indian Ocean, around 900km north of the West Australian capital of Perth. Tomorrow the final stage – the 156.69km 'Murchison Mega Finale' – will take them to the finish line at Kalbarri, 592km north of Perth, after seven days and more than 3000km of endurance racing. The 2014 Australasian Safari kicked off in Perth, with a ceremonial start, last Friday night and full competition began in Geraldton, 424km north of Perth on Sunday, September 21. Six out of six is a good score in any game, but particularly when it means the whole team has crossed the finish line after the gruelling 2014 Australasian Safari cross-country rally. ISUZU rally vehicles have taken out three class wins in the seven-day event which covered more than 3000km of the Western Australian outback. WA's Adrian Di Lallo and co-driver Rodger 'Roj' Pedersen were the best placed of the three official ISUZU rally vehicles, their production-class ISUZU mu-X in fifth outright and first in class in their home state event. 'Roj' Pedersen says the final day of the event was the toughest stage of the week. "Two kilometres into the stage we lost four-wheel-drive and it was pouring with rain and muddy. Bucketing down and really hard going. We brushed a tree and got lost – so did most others actually – and we lost a lot of time trying to find the right way, but we made it. "I feel really good now, you know, tired, but it's a great feeling to finish Safari. Sitting next to Adrian, and the whole experience, it's been awesome." Thailand's Olan Sornsirirat and Veerachai Thorangkoon – the third team in the official 'ISUZU trio' – were second in class behind Di Lallo and Pedersen, and seventh outright in their D-MAX. Team leaders Bruce Garland and Harry Suzuki came in 17th, despite missing two full days repairing their Dakar-spec ISUZU D-MAX (and being handed extra time penalties for failing to finish those days). Aside from the strong results posted by the official ISUZU rally team entrants, the two other ISUZU crews being helped by the Garland/Suzuki team have also come home well. The Thai-entered D-MAX crewed by Vorapot Bunchuaylua and Chupong Chaiwan came home in sixth, while the ISUZU mu-X being campaigned by Safari stalwart Reg Owen and co-driver Russell Cairns finished 13th outright. "We've ended up with a really great result with the team, and all the cars went really well – it's just a fantastic feeling," says Garland. "Today was unbelievable with the rain bucketing down. A whole lot of us got lost and then Steve Riley [who had been leading the event] got stuck in a ditch and a bunch of us helped pull him out. We got soaking wet and covered in mud, but we still had a good time. That's what Safari is all about. Today's final stage – the 156.69km 'Murchison Mega Finale', and a lengthy transport stage before it – took competitors from Carnarvon to Kalbarri, where the Murchison River meets the Indian Ocean, 592km north of Perth,. The celebrations – after seven days and more than 3000km of endurance racing – are expected to continue well into the night. The 2014 Australasian Safari kicked off in Perth, with a ceremonial start, last Friday night and full competition began in Geraldton, 424km north of Perth on Sunday, September 21. Open to cars, buggies, bikes and quads, only 20 of the original 26 starters in the car category completed the course. Members of ISUZU rally team are pondering how they will 'top this' after the satisfaction of taking class win and the team award for their hard work in the 2014 Australasian Safari cross-country rally. All 'official' crews, plus two others being assisted by the team, completed the gruelling, seven-day, 3500km event, which started in Perth on Friday, September 19 and finished at Kalbarri, on the northwest WA coast, on Saturday (September 27). Western Australian crew Adrian Di Lallo and Rodger 'Roj' Pedersen were the best placed of the official ISUZU rally vehicle entries, their production-class ISUZU mu-X in fifth outright and first in class in their home state event. Team leaders Bruce Garland and Harry Suzuki took 17th outright, despite missing two full days repairing their Dakar-spec ISUZU D-MAX and being handed extra time penalties for failing to finish those days. Aside from the strong results posted by the official ISUZU rally vehicle entrants, the two other ISUZU crews being helped by the Garland/Suzuki team also came home well. The Thai-entered D-MAX crewed by Vorapot Bunchuaylua and Chupong Chaiwan finished in sixth and first in class, while the ISUZU mu-X being campaigned by Safari stalwart Reg Owen and co-driver Russell Cairns came second in the same class and 13th outright. "We've again given ISUZU and its customers proof of the strength and reliability of the D-MAX and mu-X production models – they didn't miss a beat," says Garland. "With the time and budget restraints we had, we did the very best we could and we got a very good result. Obviously Harry [Suzuki] and I were hugely disappointed that we didn't finish where we wanted to be. "First outright, first ever diesel to win Safari was our goal and I really believe had luck gone our way, it was achievable. We were running to our plan and on the pace we wanted to be on Day Three, ready to challenge for third, when it all came unstuck. "Given how hard the three crews at the front were pushing, with a bit of luck I think we could have got through, but things just didn't go our way, and that's just the way motorsport is. "I'm really proud of the team. They worked really well together. We're not a big team but we get on well and everyone pulls their weight. An event like this, over seven days, is incredibly demanding, but the rally crew did a fantastic job and the strength of the result is a credit to them all. "It's also a credit to the strength and reliability of the ISUZU product, It got us through the dust and the rocks of the first six days and all the mud and slush of that unbelievable final stage. It never let us down." Adrian Di Lallo has been unstinting in his praise for the mu-X he drove so successfully to fifth outright, and the production class win. "It's awesome – a proper competitive car that I'm so impressed with. I mean, considering how hard we were pushing it and the conditions, the mu-X really stood up. He admits the lowest point of the week was on Day Three when he and Pedersen hit a creek and a fence, worrying that they had done some serious damage to the car and themselves and enormously grateful when they found they hadn't. "The high point is now. Right now. Making it through the event without a hitch in a car we cannot fault. It's a brand new car that's had limited testing, and our results are a testament to how good it is – we've been punching well above our weight. "Having Roj next to me has been terrific. It took us two days to get into the groove and then it was exactly like old times. Roj is a good friend and an excellent co-driver. He knows when to slow me down and how to keep me calm – he can do that with just a couple of words. "It's easy to get frustrated when you're driving. You almost have to have sixth sense, so it's critically important to have a skilled co-driver next you who's keeping an eye on the road ahead as well as on the road book. We're a good team." Di Lallo has acknowledged the support of his family, saying he would not be able to compete without it, and he has also expressed his gratitude to Garland, Suzuki and rally crew for their assistance, particularly his service crew, John Gray and Ian Wilson. Garland says the team is now reviewing all its options as to what it will be doing in the future.